Orthodox Church liturgical Oblation table vestments (white-gold) by Istok Church Supplies Corp. Thank you for visiting Istok Church Supplies’ section on white-gold Oblation Table vestments. Here, you will find high quality, decorated Oblation Table vestments that can be made to perfectly fit your Church’s Oblation Table. The Oblation Table plays an important role in the Divine Liturgy. It is the place where bread and wine are prepared and sacred vessels kept. For Divine Liturgy, the Oblation Table is vested with a lavish, fully covering ecclesiastical cloth. The color of the cloth matches the liturgical season and specific occasion. 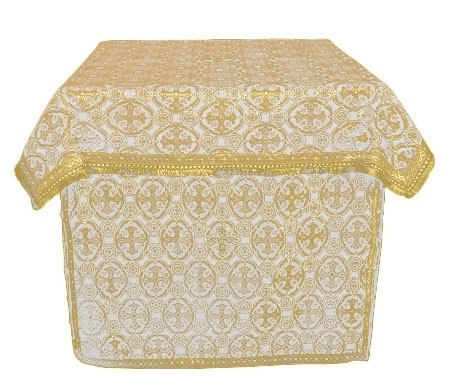 Our white-gold Oblation Table vestments are made from fine church fabrics such as rayon brocades and metallic brocades. Not only do they look magnificent but they also deliver in terms of performance and durability. Istok Church Supplies allows customers to place a bespoke order based on their preference of fabric, size and decoration. Customers have complete freedom to select an alternate fabric belonging to the same class as the one mentioned for the product and can upgrade their orders by opting for Standard or Premium decoration and/or natural velvet inserts. Customers who wish to purchase an item as it is will receive Economy decoration on the vestment free of cost. We are more than happy to provide made-to-measure services so that customers purchase Oblation Table vestments that fit immaculately. We employ expert craftspeople at our workshop in Europe to execute each individual order with care and attention. Whether it is trimmings, fit or quality of stitching, customers will have no reason to complain. We serve customers worldwide and offer multiple secure online payment methods. Apart from standard discounts which are available to everyone, we offer special money saving schemes to customers who sign up for our membership program. For immediate purchase, add a product to your shopping cart. For future purchase, add it to your wish list. Or simply share it on social media - we are confident you will find our collection irresistible!